As a new mom, it has become such a fun, and at times challenging experience learning what products work best for your baby. I developed this brand by applying what I have learned with my son to find the most practical and essential tools in potentiating my baby’s development, and of course enjoyment! Not only do we develop safe products that our children will love, but we also put a lot of thought into creating tasteful and classic designs that complement your baby’s (and your own) personal style. 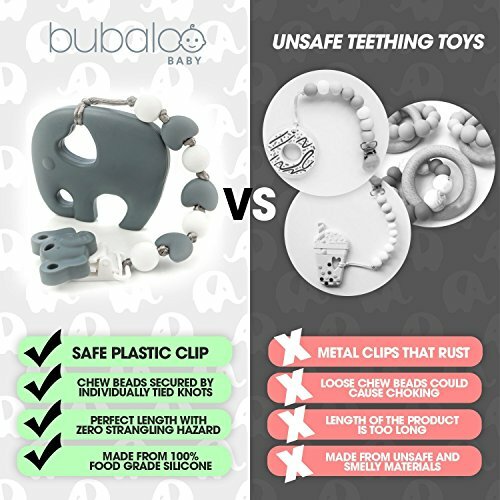 We are so excited to have you try our unique products and hope your little one adores Bubaloo Baby as much as mine does! Why Are Silicone Teethers Better? We use non-toxic food grade silicone that is both antibacterial and antimicrobial. Silicone is bendable and soft on a baby’s gums. Plastic teethers can be harsh or have hot spots that can cause gums to bleed! Wash before initial use. Hand wash with soap and warm water or clean with disinfectant pacifier wipes. Store in a dry area. Dishwasher and Sterilizer Machine Safe. Safe in temperatures -58 degrees to +392 degrees fahrenheit. 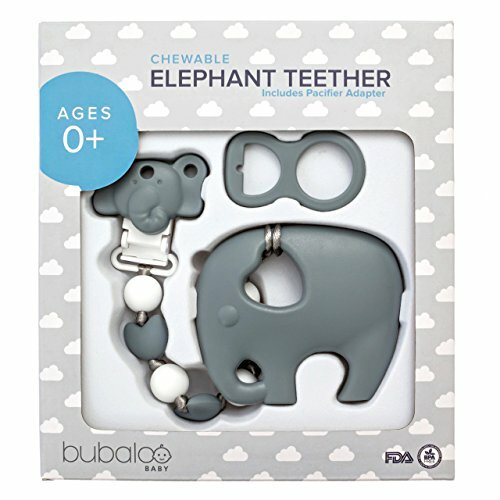 One of 2018’s Top Baby Products – A Baby Registry Must Have!UNLIKE OTHER TEETHERS that are made from smelly plastic or unsafe materials, that are not BPA Free, and can cause your baby to gag or even choke, our Bubaloo Baby Elephant Teether Set is odorless and completely safe for infants and newborns ages 0+ months. 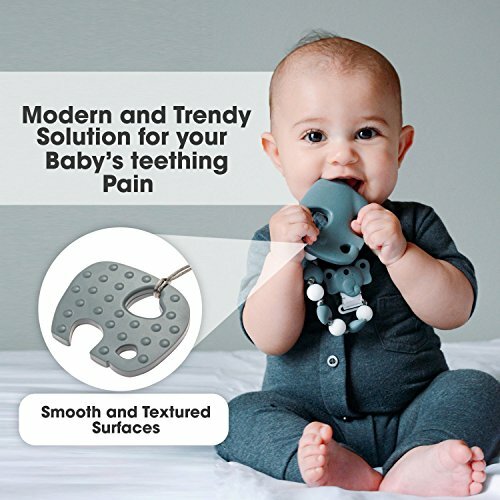 Silicone is durable, yet soft on your baby’s gums and what I’ve found to be the best solution for teething pain relief. BPA, PVC, Phthalates, Cadium, Lead and other Soluble Heavy Metal FREE. GIFT READY PACKAGING for any babyshower, baby registry, birthday celebration, or holiday. Our unique gender neutral unisex gift set will be the talk of the party! We all know that babies love to drop things. 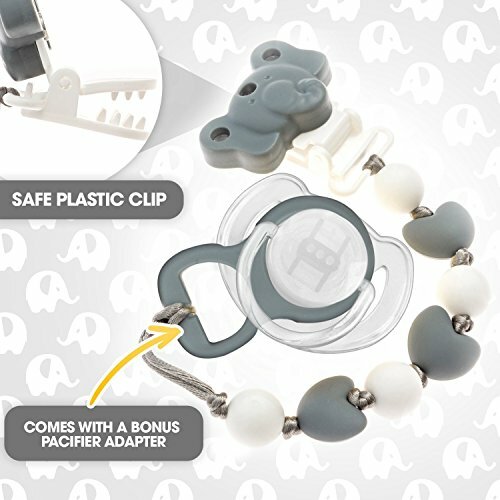 The cute silicone clip also attaches to the included universal pacifier adapter to prevent your baby from dropping their binkie on the dirty ground! 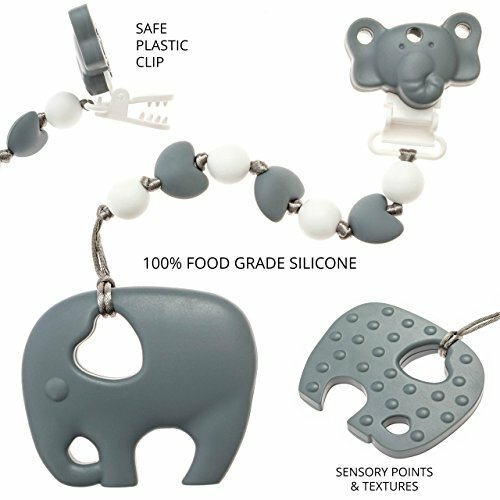 Simply untie the elephant teether and loop on the adapter to attach a pacifier, or tie the leash directly onto another soother or toy! YOUR BABY’S SAFETY IS OUR NUMBER 1 PRIORITY. All of the components in our soothie teathers are carefully curated and guaranteed to be nontoxic to babies. No Harmful Materials Whatsoever! 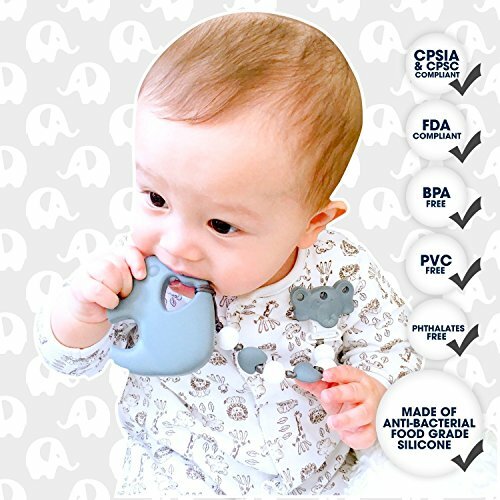 Our popular teething gifts are made of food grade silicone rubber that’s bendable and freezable. Great for infants who prefer a soothing cooling / cold sensations on their sore gums. Our product is Hand Washable and Dishwasher Safe, but we do recommend using baby friendly soap! CPSIA Compliant an FDA Compliant. 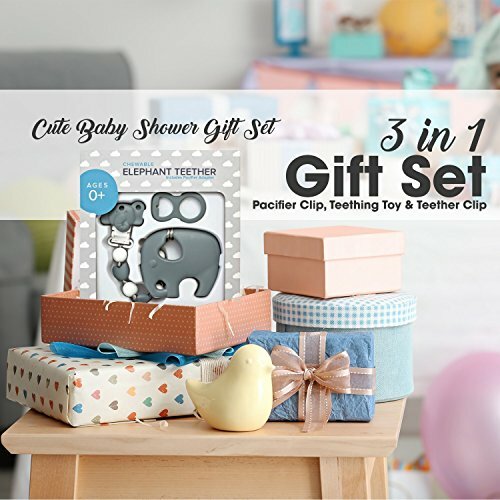 TO THE NEW AND SEASONED MOTHERS, our cool new baby shower gift set clips easily onto your baby’s clothing or car seat strap. We aim to provide functionality with a universal trendy design! 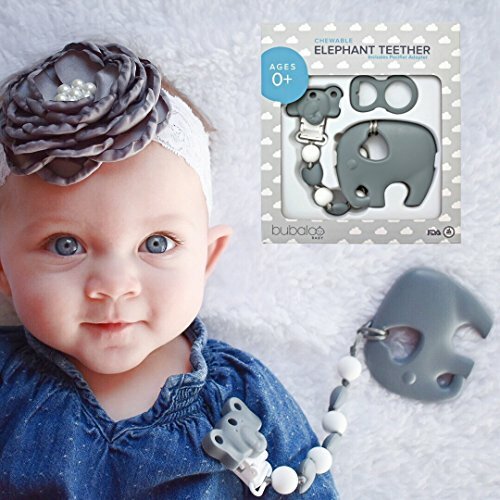 Our adorable modern multi-use wearable teether, chewable beads, and binky adapter are the perfect all-in-one solution for soothing chewing teething babies. Universal and Compatible to fit with NUK, Soothie AVENT, MAM, WubbaNub, and many more! REST ASSURED, when you buy from me, Eliso, your satisfaction is guaranteed! If there’s an issue with your product for any reason, I’ll refund or replace your items free of charge. I live in the USA and take pride in offering the very BEST in customer experience and product quality! 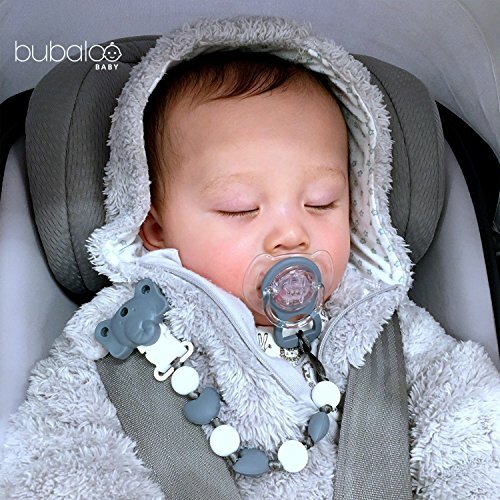 We are a small boutique brand dedicated to you and your happy Bubaloo!